One of the signature elements of my lessons is the camera angle. The “over the shoulder” shot is far easier to translate than the “straight on” shot in my opinion. Over the years many of you have voiced your approval. However, there is one group that has never liked this camera angle: left handed guitar players. For those players who are unfortunate enough to be born left handed (kidding), this video angle could not be worse. 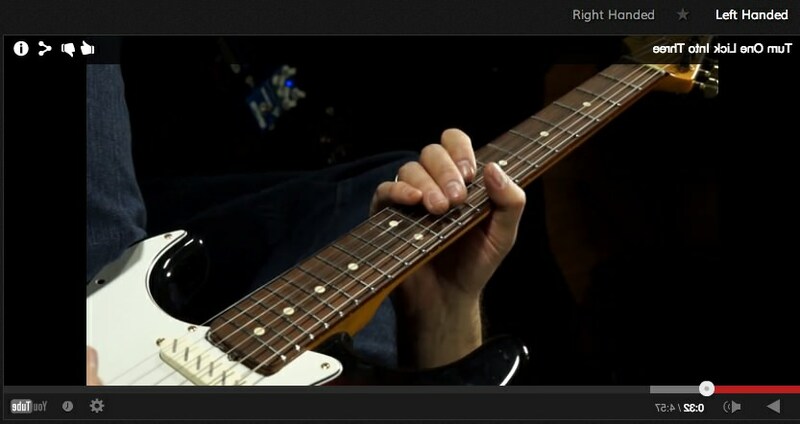 Today I discovered a magical solution to this problem, so on every free lesson page you’ll now see two links above the video that allow you to set it for right-handed, or left-handed viewing. Selecting “Left-Handed” will flip the entire video player horizontally. Unfortunately, this includes all text, video controls etc… but everything works. This feature requires a modern browser, but the latest version of any popular browser should allow it. Check it out in the Free Lessons Section.